After big meals and periods of feasting, it is most often soups that I turn to for comfort. Cantonese soups prepared at home are great. But sometimes my body hungers for equally-comforting creamy, thick Western-style soups. It is at times like these that I head to Cedele. Alas. The Suntec City outlet has now been replaced by Spinelli. !@#$%. Thankfully I found another soup store which has taken over the unit that was formerly Ben & Jerry's. Souperlicious sounds cute and promising. I opted for the Beefy Goulash ($6.50 for regular size) and added $3.90 to make it a Souper Sandwich Combo, which gave me my choice of Half Sandwich and Ice Lemon/Peach Tea. The Beefy Goulash was a thick stew with soft carrots and tender beef cubes. Opt for sour cream to be added into the stew to enrich it further. The stew had a nice earthy sweetness from paprika though I found it to end off a tad salty. The half sandwich, Cheezy Tuna Melt, was ordinary with insipid focaccia bread and commercial-tasting cheese sauce. The round corn chips that came with it was excellent to munch on and dip into the stew! Dad took the Shroomy Mushroom ($6.50 for regular size) and scooped the bowl clean. My Cantonese dad generally prefers Chinese food and steers away from cheesy, creamy dishes. So I think the Shroomy Mushroom did well. A few spoonfuls from his bowl made me understand why it was polished clean. Creamy without being heavy. Light without being bland. Fungi sweetness without being overbearing. Chew On This: Ask for your Souper Card and get a stamp with every $5 purchase. Free goodies like Ice Lemon Tea, SouperCombo Upgrades and Regular Bowl of Soup when you hit certain points. After the lovely lunch at Braise, I was off to town to burn off a couple of hours before dinner. It was a such a foodie's Saturday. Dinner was at the invitation of 938Live and hosted by Goodwood Park Hotel. The diners present were 938Live Music Director and Senior Producer-Presenter, Eugene Loh, and the other resident foodies on Foodie Lunch Pick. A pity Samuel could not attend or else we would have the complete set from Monday through Friday. Dinner started with a Cream of Tomato soup. It was warm, tangy and had a good depth of flavour. This was my favourite dish. Next course was the Grilled Scallop with Asparagus. The scallops were fresh and succulent. I thought the Japanese sauce with mirin went well the scallops. This light-tasting dish was no less tasty, though it was on the safe side and maybe a tad boring. The third course was a choice of Meltique Sirloin with Mushroom Sauce or Baked Cod Fish with Orange Butter Sauce. Being a cannibalistic cow, I opted for the steak. Okay, okay... I was actually intrigued to see how the Meltique beef would turn out here since I don't particularly like the 'artificial' texture of such beef. How did it turn out? Well, I think I still prefer the taste and texture of 'normal' beef sans artificial marbling. But I bet fans of Meltique beef beg to differ. The next course has got to be one of the most unique Turkeys I've come across. Hainanese Turkey sounds more hawker food than Christmas but it works! The Hainanese Chicken Rice-que presentation and accompanying condiments like the soup with bean sprouts, the tomato and cucumber slices, the rice ball, and the black soy sauce, minced ginger and chili sauce obviously mirrored Chicken Rice. I really like the way that turkey is presented here. Sure, the rice ball wasn't fragrant enough and the turkey wasn't as tender as chicken but I think the novelty is in taking something festive and linking it to something very familiar to all Singaporeans. Lastly, dessert came in the form of DIY at the desserts buffet counter. I randomly picked some onto my plate and lamented at the fact that there wasn't durian featured in a hotel that has established itself as a haven for almost all things durian. It is apparently off-season for the King of Fruits. Alas. For the Hungry Cow, it was an eat-ventful day with a 3-course set lunch at Braise and a 5-course tasting menu dinner at Goodwood Park's Coffee Lounge. It was great finally being able to meet Eugene and Irene in person after chatting with them on air for slightly over a year. O where art thou, Melanie? Haha. Thanks to 938Live and the chefs, wait staff and Justina Loh of Goodwood Park for organising this tasting dinner and hosting us. Chew On This: The Hainanese Turkey was introduced last year. This year, the new item is Turkey Satay! Marinated pieces of turkey and pineapples are skewered, grilled and served with a spicy peanut sauce. How about next year? Turkey curry? Turkey laksa? The chefs remained tight-lipped so only time will tell. Have a Blessed Christmas, you guys! Spread some love. See? My doggie loves his festive reindeer. Haha. The onslaught of turkey, roast beef and ham have started. After one too many Christmas dinners, these goodies become repulsive- a sure sign of festive-weary taste buds. That is when a simple Japanese dinner at Liang Court's basement brings joy. The Mini Steam Eel Rice ($1.80) wasn't the best start though. Fishy and bland.... and the eel was reccession-sized. Thankfully the Beef Curry (~$9-10) was so comforting. Soft root vegetables and tender beef slices were in a mild Japanese curry. Accompanied with warm rice and pickles, it was absolutely yummy! One more plate of rice please. While eating the Beef Curry, I spied my neighbour's udon and had a sudden craving for it. Udon-lust. I gave in and ordered a simple udon with seaweed and an egg (~$7). The food's simple and good. Nothing fancy but perfect to combat festive fatigue. Now back to more turkeys over the next few days. Chew On This: Iced water is served at ZERO cost. Cheers to that. A lunch for foodies and food-bloggers was kindly arranged by Hinata at Braise. A total of 28 people signed up and quite a few food-bloggers turned up too. I was happy to catch up with friends such as Recent Runes, The Skinny Epicurean, Joone, Superfinefeline, She Bakes & She Cooks, Dim Sum Dolly and meet new ones like Foodies Queen and The Importance of Salt. But before lunch was served, a complimentary champagne-tasting was conducted courtesy of Lollapalooza. Perfect way to start a Saturday lunch at Sentosa! Champagne Larmandier-Bernier Brut Blanc de Blancs. 100% Chardonnay. Floral, spicy and a little sharp. Champagne Marie Demets Brut Tradition. Mostly Pinot Noir with about 5% Chardonnay. Biscuity and yeasty. Delicious. Champagne Larmandier-Bernier Rose de Saignee. 100% Pinot Noir. Dry with red berries. Ends off a little bitter at the back of the throat. And now, officially back to lunch. A warm bread roll with bits of sun-dried tomatoes and rosemary, paired with a good salted butter certainly whet my appetite. A good sign of things to come. My choice of starter was the Pressed Foie Gras with Sauternes and Chamomile Jelly, Vegetable a la Greque. The pressed foie gras was rich, earthy and creamy. In fact, the richness was a little overwhelming for me. I guess that's where the sweet jelly and large salt crystals try to balance things out. Main course for me was Roasted Fillet of Beef with Savoy Cabbage, Beef Cheeks and its own Braising Sauce. The beef cheek wasn't as tender and gelatinous as I was hoping for but top marks for the delicious sauce. What was better was the beef fillet. Sandwiched between creamy mashed potato that was packed with buttery goodness, and a tasty savoy cabbage base, the beef fillet was tender and flavourful. Here's the pork option of Pork Three Ways- Confit Cheek of Pig, Pan Roasted Pork Belly and Pig Tail Roulade with Spice Port Wine Sauce. And the fish option of Salmon with Stuffed Zucchini Flower, Vin de Aubois Sauce. Dessert for me was the Selection of French Cheese with Mesclun Salad. Not really much of a salad but slices of green apples, pine nuts and dried fruits. But I still enjoyed nibbling on these together with the cheeses. Another dessert that some chose was the Green Tea Cream Brulee with Margarita Sorbet. But it was the Pear Tart with Vanilla Ice Cream that made me break the Thou Shall Not Covert Thy Neighbour's Dessert commandment. 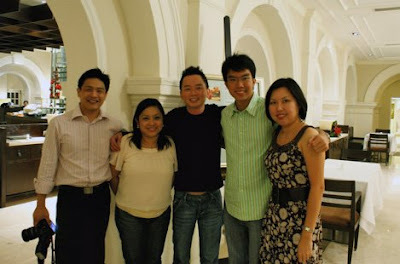 What a leisurely Saturday lunch at Sentosa it was! The setting of Braise was chic and clean with a predominating white theme. Sitting by the large glass panel watching people play beach volleyball and sweating it out in the sun at Palawan Beach while I remained cool in air-conditioned comforts was just surreal for me. For the first time, I did not break a sweat in Sentosa. Food-wise was generally good and the plating was beautiful. Big thanks to Hinata for putting this together! Great meeting everyone and glad that Jeremy's Sis and Mum could join us. Dude, I think a revisit is on the cards for your Mum. Cheers! Chew On This: Coming to Braise is actually easier than it seems. For those who drive, park at the Beach car park and take a 5-minute walk. For those who prefer the train from Vivocity, alight at Beach Station and take the tram to Palawan Beach (just one stop!). 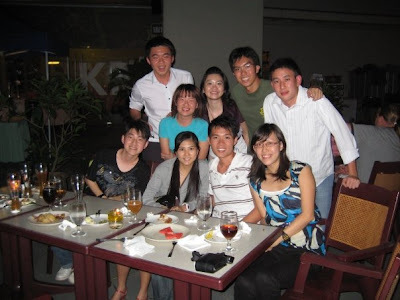 Location: Braise @ 60 Palawan Beach Walk, Level 2, Singapore 098498. This special lunch set deal is open to everyone and anyone! So tis the season to grab your friends, spouses, makan kakis, colleagues, neighbours and enjoy a wonderful lunch at Sentosa! To RSVP, please drop me or Hinata an email at thehungrycow@yahoo.com.sg and samantha.michaela@gmail.com respectively, with your name, contact, number of people and choice of starter, main and dessert by 10th Dec (next Wed). Vegetarian and other dietary restrictions can also be catered to. Btw, corkage will be waived so please feel free to BYO. Chew On This: Sign up for this to really chew on this! Haha. I volunteered to help source for a place and negotiate the menu for November's Steak Lovers' Association dinner and gladly fixed it at Cherie's Pan. This small casual bistro has its merits- central location, near an MRT station, good value, above-average food and comfortably air-conditioned. It helps that I've eaten there a few times and gotten to know Aisha, the Manager, who has been extremely helpful with the menu negotiation and dinner details. Big thanks Aisha! So without further adue, here's my recap of the dinner. Dinner kicked off with some bread and olive oil (but I was busy herding lost sheep cows and didn't get to take the photo.) Haha. Then came the starter of Australian Crabmeat Served on a Bed of Baby Spinach with Balsamic Dressing. It was a very nice mix of fresh flavours with the crab meat lightly-seasoned and mixed with chopped bell peppers. The baby spinach provided a lush, soft bed of greens dressed simply with balsamic vinaigrette. Certainly puts the 'A' in 'appetiser', especially at 8pm on a Friday night! And what better to comfort hungry souls than a warm bowl of Wild Mushroom Soup. This was creamy and dotted with bits of fresh mushrooms. and Lyonnaise Potatoes, or Pan Oven Roasted Wild Seabass Topped with U.S. Scallop Served with Sautéed Courgettes and Lemon Vinaigrette. Being afraid of being an outcast and accused of not fighting global warming by getting cows off the fields (and into our stomachs), it was a unanimous vote for the ribeye for those opting for the set dinner! Woot! The steak was a chilled Australian Ribeye, about 300g and though not a fantastically-over-the-moon kind of steak, it was more than decent. As requested, it was seasoned with salt and pepper, and the Bernaise sauce was served on the side. The steak surface had a glaze of caramelized fragrance of beef fats, most possibly oozing from the ribeye's own fat. Hearty and sufficiently tender, it was my pleasure to wolf it down...slowly between sips of wine, pieces of conversations and generally running around. Then it was time for dessert- Oven-Baked Fuji Apple Served with Vanilla Ice-Cream. The apple was baked with cinnamon and sugar which helped balance out its tartness. Unfortunately, the vanilla ice cream spotted small ice crystals, probably due to slow or uneven freezing. While the texture was more of ice than cream, I was happy that the chef at least made an effort. Real vanilla beans were used and it wasn't conveniently store-bought. After all, this place isn't known for ice cream. All is forgiven...especially after the wines. Haha. And talk about wines... I had arranged for five Brazilian wines for the dinner- One sparkling, one white, two reds and a dessert. I absolutely loved the sparkling! Forgot to take a pic of them too. Oops! Maybe I'll take a separate picture of new bottles and insert it in later. Haha. Maybe. A few strokes of genius were struck by SLA-ers coming up with portable heart defibrillator and a suggestion of a durian outing! I think food and wines bred creativity eh. It was a really great night of food, wines and fun as we met many new faces and indulged in fellowship! Our first Friday SLA dinner guys!! I had fun planning part of this dinner and it was truly this cow's pleasure. Hope you guys had a good time too! 17 happy SLA-ers. Cheers and as always, thanks to Thomas for liaising and coordinating with the SLA-ers! A side note on the food at Cherie's Pan. You'll find that I've described their food as 'above-average' in the opening of this post. But for the specially-arranged SLA set dinner ($31 nett, excluding wines) that we had, the food was generally much better and a notch higher than their usual menu offerings. 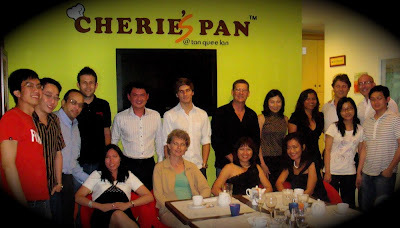 So kudos to the kitchen team and great job, Cherie's Pan!! Chew On This: Cherie's Pan will be closed for about a week in December for renovations. So do give them a call before you head down. Sadly, with the next-door child-care arm doing better business than the bistro, it has been decided to downsize Cherie's Pan while expanding Cherie's Hearts. *Group photo courtesy of Thomas.